"Ms. Pilar Rubio is the cover model on the next, new Annihilator CD cover! The shoot was done by famed Spanish photographer Rebeca Saray, and she looks like the perfect cross between GORGEOUS and EVIL! As always, Annihilator's long-time artist Gyula Havancsak has done his genius magic to the chosen Pilar-is-evil photo! Pilar Rubio (top Spanish model, Dancing With The Stars host, designer/owner of Metalhead Clothing) dropped by Jeff Waters' bus to hang out and see his Epiphone/Gibson Annihilation Metal Guitar Clinic, in Madrid, Spain. She's is a fan of the band and, of course, a metalhead! Jeff, Dave and Annihilator are endorsing Pilar's new MetalHead clothing line, of course designed for metalheads! 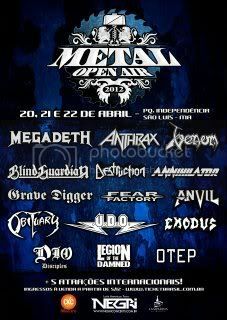 The band will also play the Metal Open Air festival at Parque da Independencia in Sao Luis, Maranhao, Brazil on Friday, April 20th. MEGADETH will be headlining the event. 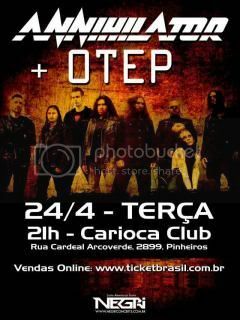 According to guitarist/founder Jeff Waters, shows in Sao Paulo and Buenos Aires are due to be confirmed soon. "The internet and cell reception was rarely working for a few days so expect lots of killer footage in the next day or so from everyone!"